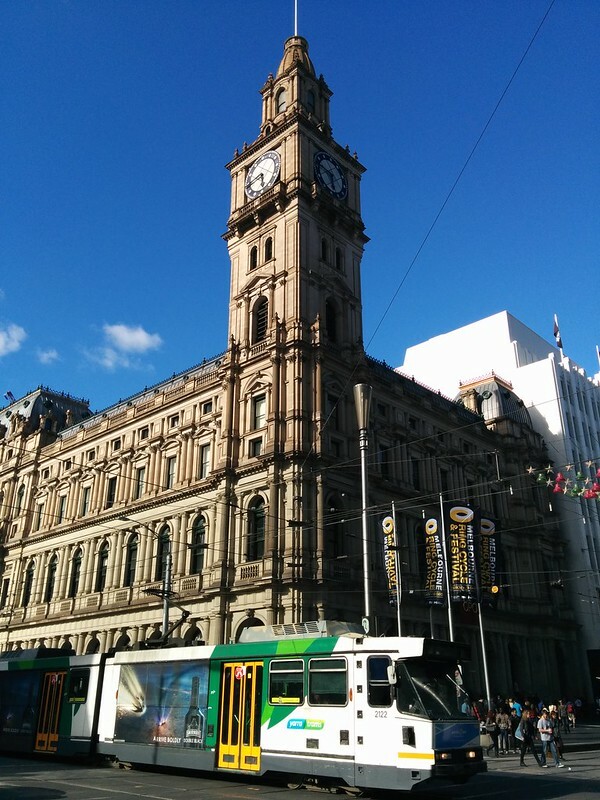 The Melbourne General Post Office was built in the 1860s, and served as GPO until 2001. Nowadays it’s a shopping centre. 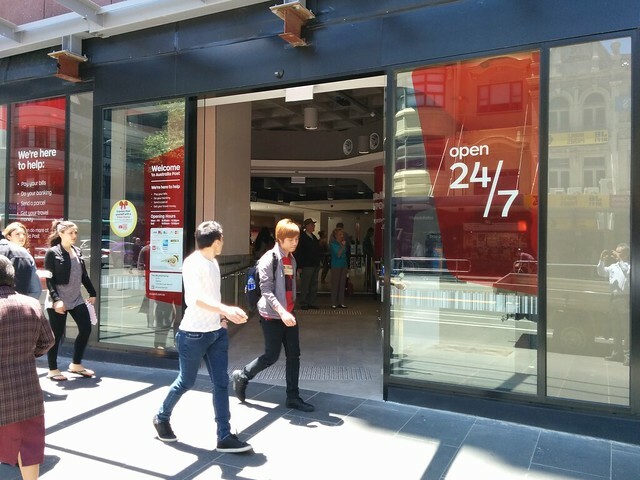 Australia Post moved its retail operations a little north, to the other side of Little Bourke Street, with a big (but no doubt cheaper to run) Post Shop. Now that too has closed, in favour of a new one a little further north again, on the corner of Lonsdale Street. I assume it’s still under construction — at least, it looks that way. Inside the most interesting thing of note is the self-service checkouts and vending machines. There are still humans serving, in what appears to be a similar fashion to other post offices. But PostPaks, stamps and other products can be bought via the machines. This, at last, means you can buy postal products without having to queue behind dozens of people wanting to buy gifts and pay bills (something I only ever do online these days). And a bonus: the frontmost section is open 24/7. It’s got parcel pickup lockers, and snack-style vending machines. If you’re ever in the vicinity and in urgent need of a 10-pack of stamps late at night, you’re in luck. I’ve been using the self-serve machine in the Emirates House arcade for the last year or so, and it works well – you can post from there as well as pay for the packaging, so unless you’re sending overseas (when you need to show ID) you don’t need to queue up at all now. Always amazes me how many people will happily spend their lunch hour queuing in the post office to pay their phone bill. Many 7-elevens sell stamps too. 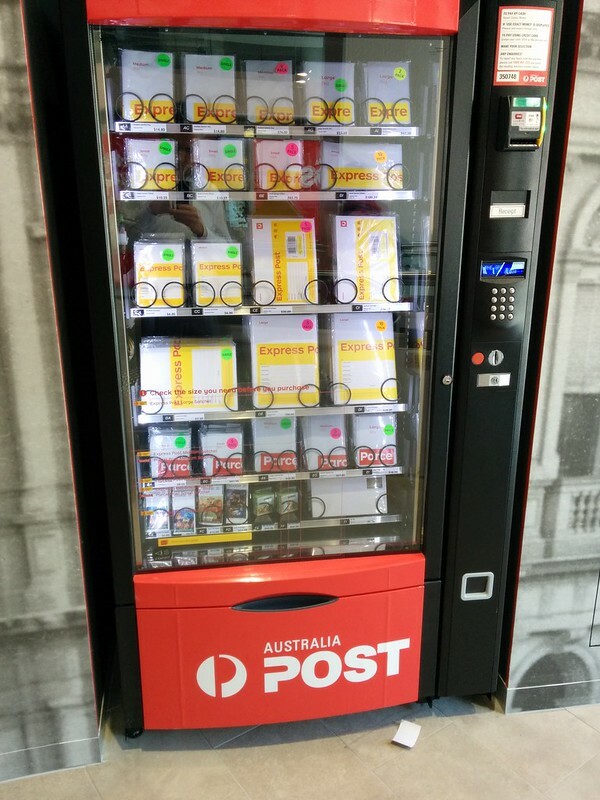 I’m pretty sure I remember stamp vending machines just outside the front door of the old GPO building many many years ago. The advantage of being able to access a customer service person is when you need advice on the best type or size of packaging for a parcel. Buying from a vending machine doesn’t always suit. @Jen, I think you’re right – I recall vending machines at the old GPO. They didn’t seem to have them at the previous Post Shop though. Last year you couldn’t get Christmas stamps from the vending machines and had to queue up. I hope they put Christmas stamps in their machines this year! Post office should never have moved! Posting a letter was a serious business, and buying stamps to attach to letter was a grave matter, best handled by the staff at the magnificent GPO. I think they rather did themselves out of a job at such a grand place by their surly and grumpy manners. There were primitive stamp vending machines around in the 1960s, then they disappeared. I did not know the Post Office was moving again. I’ll need to get a bus then! Australia needs a lot more vending machines. A bit like Japan. How about one that dispenses pure water (or cola) into your existing bottle instead of having to buy a new bottle every time? @Jacob – You’ll find very effective “vending machines” dispensing very clean and pure water capable of filling any vessel that will hold them all over the city! I’ve got not only one, but three installed in my apartment, and another I use to clean myself! In all seriousness, if you live in Melbourne and you drink bottled water, you’re wasting money and adding considerably to carbon emissions* for a product that is likely cleaner coming straight from your tap. Melbourne is one of the worlds only major cities to have the majority of its water catchment areas closed off entirely from development. The standards Melbourne Water is held to, are much higher than the average water bottling plant. *the bottled water industry ships a heavy product that falls naturally from the sky! It is, in most developed nations at least, unnecessary, excessive and unethical. Originally at the GPO were the Private Boxes for Melbourne 3001. For some time these have been at the GPO Private Box Centre at 380 Bourke Street. By going to this Centre it’s possible to deliver stamped mail to a Melbourne Private Box (the equivalent of the City Post Boxes mailing chute at the old GPO).